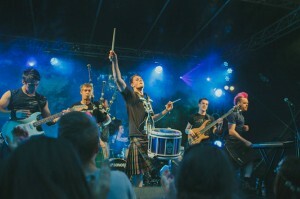 BAGS OF ROCK deliver a high energy mix of Scottish Bagpipes combined with heavy rock rhythms. They perform with an infectious conviction that has created a trail blazing musical combination. The band has performed all over the world to capacity crowds in Italy, Germany, Ukraine and Malaysia . They played at the Klupfel and Folk am Neckar festivals in Germany topping the German Charts twice with tracks from their first album, ‘The Next Level’. Closer to home, the band has by popular demand performed for two years at Stirling Castle’s Hogmanay Party, headlined Glasgow’s George Square Hogmanay and the o2 Academy, and rocked tens of thousands at festivals around the UK. They also performed for HRH Queen Elizabeth as part of the 2012 Diamond Jubilee celebrations. BAGS OF ROCK were praised by entertainment mogul Simon Cowell . He described the band as, “Great ambassadors for Scotland – obviously very talented musicians”. The Bags of Rock band features…. Hire Bags of Rock from the Neil Drover Agency. Call or e-mail today for a no obligation quote. Prepare to be Entertained!